To say we appreciate our customers only begins to capture the depth of our gratitude. With word of mouth as our bread and butter (i.e. our main form of marketing), it’s definitely not an overstatement to say that you all literally brought this dream to life. My heart swells with their feedback and their genuine desire to share their favorite piece of gear. So it is with heartfelt thanks to you all that we put together this ‘Ode to Our Customers’ collage. Tread happy (and lightly) out there! Five years ago, I started Purple Rain Adventure Skirts from a dining room table in a rented house in Portland, Oregon. At the time I was living with three dudes, my partner being one of them. They let me take over the main space of the house with a $60 Craigslist serger and the sewing machine my grandma got me in college. I didn’t have a printer, so I literally walked to the library to print shipping labels and I reused paper grocery bags as mailers. My original skirt listing on Etsy was for $40. I had no idea how to value my time or talent. I just knew I wanted to make hiking skirts. But the story of Purple Rain Adventure Skirts actually goes back to 2013, during a cold, dark Minnesota winter. The summer previous I quit my desk job and flew to Georgia to hike the Appalachian Trail. Everyone has a different reason for taking to trail and at the time I wasn’t sure of mine. I just knew I had to make it to Maine, that my life would somehow be marked by that momentous achievement. Two months after I finished the trail my brother died suddenly. Perhaps my calling to trail was to build the inner strength of living with tragedy. I moved back home to be close to family. Between grief and post trail depression, I had trouble keeping a job. I spent that Minnesota winter grieving and sewing and dreaming of being on trail, where life was simple. During my darkest days, the Purple Rain Adventure Skirt was born. 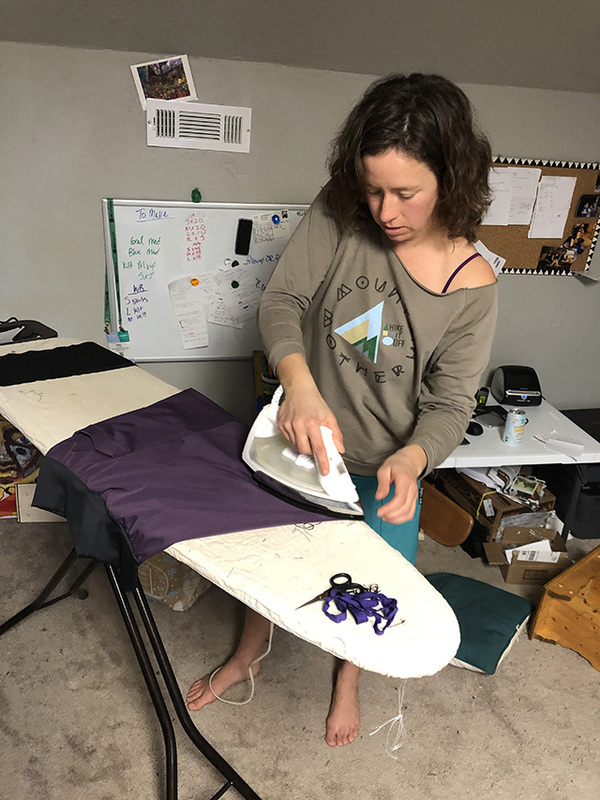 That following summer I found myself back on trail, hiking a 500-mile section of the Pacific Crest Trail and wearing one of my own skirt creations. To make my skirt, I scoured thrift stores, hacked up old hiking pants, and patched on a pocket and a yoga-style waistband. Within a few miles, I knew I was on to something. I loved the airflow and the ease when nature called. I loved having my phone, map and pee rag easily accessible. I loved not having to carry around a dry bag ‘purse’ while in town. After finishing our trek, I began researching fabric sources and never looked back. With zero business experience, I didn’t’ know what I was up against, and maybe that was a good thing. I just got to work designing great pockets and dialing in sizing. I heard about a grant program through Mercy Corp Northwest. I completed the program that included business coaching and a grant to buy hard assets for the company. I purchased industrial sewing machines and a printer so I could stop wasting time at the library. A year after launching, I went full time with Purple Rain Adventure Skirts. I’m incredibly thankful to the good friends I made in the hiking community who were and are passionate about hiking skirts. They’re the ones who helped me get early traction, and it’s been a word-of-mouth advertising endeavor ever since. For the first four years of Purple Rain Adventure Skirts existence, I made every single skirt myself. Only in the past year did I hire someone to help me out. It’s crazy to think how hard I worked in the first few years, especially when throwing a new baby into the equation. While I sometimes question whether I’m simply a glutton for punishment, doing everything myself also helped to put money in the bank and meet my family’s financial needs. I love being a small company and am in no hurry to rush the process. It allows me to be at home with my young son and to have a flexible lifestyle. That is what’s most important to me now. I love that it’s become a family business. Together, we take road trips to events and my partner, Ryan, is my unofficial advisor. My goal with the business is to eventually become a B corp. I feel like I owe it to my son to build a sustainable business. I’ve taken many active steps to that end, which you can read about here. When I think about my humble beginnings, I cannot distinguish between the creation of the skirt and the pain of my brother dying. I love my business and the fortune and success it has brought me and my family. But I can’t say I would have done it if my brother hadn’t died. Maybe there is the life lesson in there, and what Wes is trying to teach me. We are made to do hard things and through pain we grow. And I can gratefully say I am growing the life I love. Here at Purple Rain Adventure Skirts, we believe that the catalyst for change lies within us all. Through a connection with nature we see the importance of treating others, including Mother Earth, the way we want to be treated. We are inspired by the Leave No Trace principles of the backcountry and strive to apply the same philosophy to business. - We purchase OEKO-TEX certified fabrics. This means the fabrics we use are not only free of harmful chemicals, but also have been produced in a way that respects human rights, labor standards and the environment. (Note: our goal over the next year is to move toward fabrics made from recycled content. We also would eventually like to incorporate performance wool when the price comes down and sourcing is more transparent). - We purchase deadstock fabric, which is industry speak for leftover material from large manufacturers. Purchasing deadstock fabric keeps it out of landfills and reduces demand for new materials. - We resell usable fabric remnants on our site. You can get 6 ounces of polyester/spandex knit performance fabric woven with moisture wicking yarn for $4.99. It’s perfect for headbands, hairbands, crafting or costumes. - We reuse fabric scraps ourselves, making Halloween costumes and new clothes for ourselves and our families. - When demand grew to more than we could keep pace with ourselves, we hired a local seamstress here in Medford, Oregon. This reduces shipping impacts and keeps the money and job local (lord knows we need it in Medford!). Our seamstress loves the environment too and actively works to cut waste. She’s also a kickass entrepreneur mama. Our founder, Mandy, and her seamstress literally hug after each meeting. - Purple Rain Adventure Skirts International HQ is in Mandy’s home. Carving out a space for her studio within her home lessens utility usage. To offset the electricity that does get used to create our hiking skirts, we purchase energy blocks from Blue Sky energy. This means our energy comes from green sources, such as solar and wind power. - When shipping out our skirts and kilts, we use mailers made from 100% recycled materials that are also reusable. We also use 100% recycled paper for packing slips. And, Mandy walks all Purple Rain Adventure Skirt orders to the post office, eliminating fossil fuels consumption. (Note: we also avoid plastic wrap, which often covers new apparel items). - This fall we took the step of becoming an Oregon Benefit Corp for Good, meaning we’re now recognized as an Oregon Benefit Company. This is the first step in the stringent process to eventually become a certified B Corp. It demonstrates our commitment to the Triple Bottom Line of people, planet and profit. - We offer the option of custom orders. People can have a skirt made to their measurements. This means getting a skirt or kilt they really like and that actually fits, leading to less consumption (i.e. having one great black skirt versus two or three you only kind of like). - Purple Rain Adventure Skirts are built to last. We design our hiking skirts and kilts to withstand six months of daily hard wear and tear. We have customers who continue to wear their skirts even after they complete their thru hike. After Mandy’s AT hike, she distinctly remembers throwing out her clothes at a hotel in Portland, Maine. And, we know many people who ceremoniously burn theirs. But continue to wear them, gasp!!! The picture below shows a customer with Mandy at PCT Days. 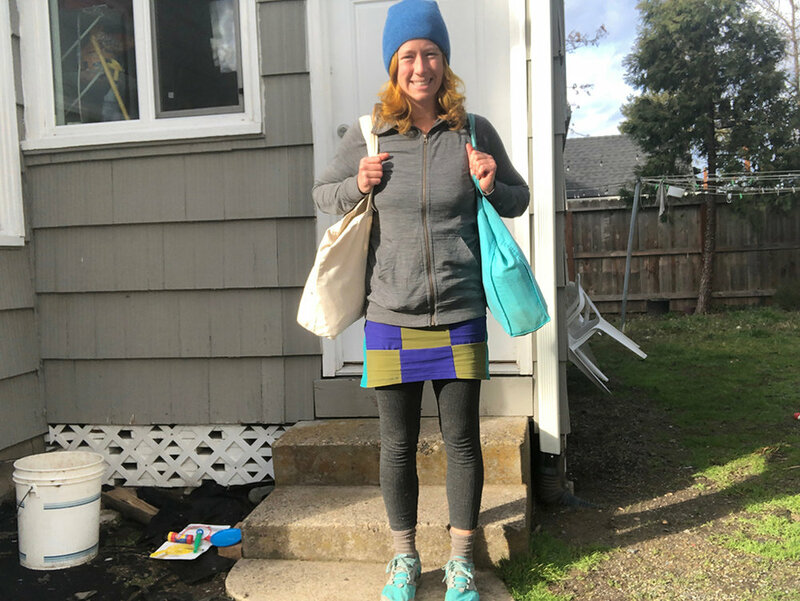 Mandy made her a custom skirt for her 2016 thru hike and she is still wearing it. We see this as a true testament to paying a little extra for what you really want and what you will really use. Mandy fondly remembers making that skirt and wondered how it would work for her. She even put a little pee rag loop on it. “It was such a treat to meet her and see how the skirt held up,” Mandy said. We see sustainability as more than just fabric sourcing. It has to do with our everyday choices, like walking instead of driving and bringing your own bag to the grocery store and your own to-go containers to restaurants when dining out. It is making choices that decrease demand for fast fashion and single-use plastics. It's making a conscious decision about what we choose to bring into our home in the first place. Will we actually use it or will it end up hanging in the closet or in the goodwill pile (most of which ends up in landfills anyway)? I get easily overwhelmed when I think about climate change. I'm scared for the kind of world my son will grow up in. We live in a beautiful place that has hazardous air quality for at least a month a year from wildfires. And I've seen this increase just in the short time we have lived here. As a business owner that contributes to consumerism I feel an obligation to do business with an Earth first and kindness approach. When it comes down to it, our daily actions are what really matter. We have the power to make change with how we spend our money. Vote with your dollars, believe me, businesses will listen. We are all in this together and what we do today shapes the world for our children, one skirt at a time. Do you feel as passionately about environmentally friendly business practices as we do? Share your thoughts with us via a comment below! All of our hiking skirts and kilts are made by hand here in Oregon, either by our founder Mandy Bland or by a local seamstress. 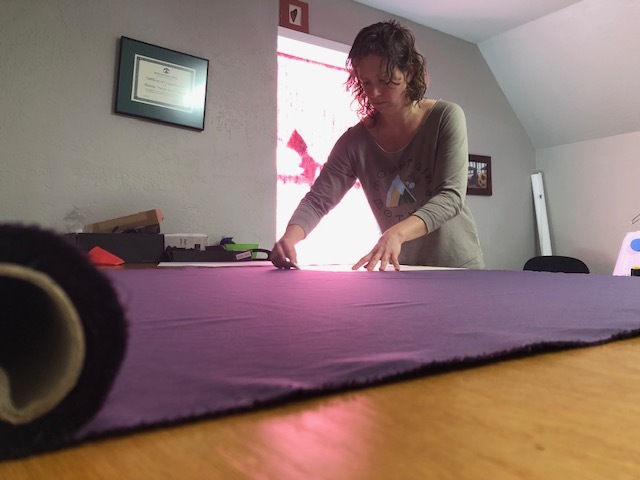 Today, we’d like to offer you a glimpse into the production process through a photo essay showing how Mandy starts with bolts of technical fabric, transforming the material into Purple Rain Adventure Skirts. Questions on how we make our skirts, where the material comes from or how Mandy balances raising a son with finding time to build her brand? Leave a comment below! After several years of not being able to find purple fabric, we’re thrilled to announce that Purple Rain Adventure Skirts now offers PURPLE skirts!!! And better still … you can WIN one! The GIVEAWAY ENTRY FORM is at the BOTTOM OF THIS POST, but first we want to share a bit of the backstory with a short Q&A! How are the purple skirts made? Because we were unable to find purple fabric, we decided to have it custom dyed using an environmentally friendly process. Our purple fabric has a STANDARD 100 certification done by OEKO-TEX. This is a worldwide consistent, independent testing & certification system that tests for harmful substances used during all stages of production (raw materials, intermediate, and end product). You can learn more about it here. How did you select that exact shade of purple? Instead of making the choice ourselves, we put it out there to our customers and community. We posted several shade options on social media and asked people to vote. The one we went with was the clear winner. It was a lot of fun! A huge thanks to everyone who gave us their input! How did Purple Rain Adventure Skirts get its name? Flat out I named myself and I'm not shy about it. Other hikers were not very creative trying to name me 'High Energy' or 'Manda Panda'. I let it go for awhile until I started dreaming about a rain skirt. My trash bag skirt just wasn't cuttin’ the mustard after a couple hundred miles and I was in awe of all the handmade gear out there. Another female hiker had made her rain skirt. She told me where I could buy the fabric online and that they had all kinds of colors. I got giddy about the fact that I could make my own PURPLE rain skirt. I was currently on trail so I sent the request to my mother who, bless her heart, ordered the fabric and made me one from a tutorial online. I wore that thing everyday for the rest of my AT hike. I loved that the name was something tangible, I had a purple rain skirt. But also that I was from Minnesota for the Prince influence. I had been living in Portland, OR before I left for the hike so rain wasn't a big deal to me. I was definitely the hiker who kept on hiking in the rain while others stopped at shelters … or never left them, all because of that purple rain skirt. Check out the pics below showing Mandy’s evolution from trash bag skirt to her homemade purple rain skirt (the true original!!!). Any other fun facts to share about the purple hiking skirts? 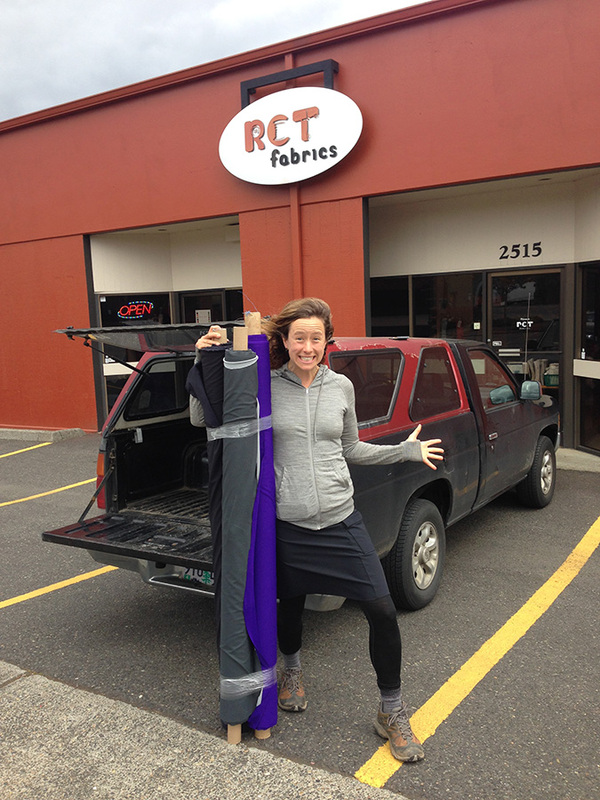 The first year Purple Rain Adventure Skirts was in business Mandy found 20 yards of an awesome purple fabric. She way overpaid for it, but there are a handful of ladies still out there that have that original skirt. Use the form below to enter to win a one of our NEW purple hiking skirts! Entering your email address will unlock opportunities for bonus entries, including sharing about the giveaway on social media, buying a skirt or kilt, and following us on Instagram. The winner picks her/ his size. Want to learn more about the purple color skirt? Check it out here!